What is the Red Hat Society all about? 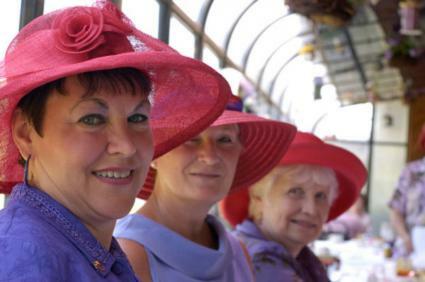 If you're an energetic, playful, and spirited woman over 50, the Red Hat Society wants you! Created in the late 1990s among a circle of friends, it has blossomed into an international organization intent on celebrating mature women with élan and enthusiasm. British poet and children's author Jenny Joseph penned the poem Warning, the inspiration for the Red Hat Society, in 1961. The poem starts, "When I am an old woman, I shall wear purple, with a red hat that doesn't go." It's basically warning the reader that if you expect an "old" woman to act a certain way, think again. There's too much fun to be had to worry about such nonsense. Society founder Sue Ellen Cooper, known as "Exalted Queen Mother," gifted a friend a copy of this poem and a red hat. Decked out in her own red hat found at a thrift shop, Cooper and her friend started going out for tea. Two became four, four became eight, until within a short time, nearly 20 friends were flashing southern California the full red and purple. That group splintered off into another, and as the women attracted media attention, the word of this frivolous "dis-organization" spread. Red Hatters believe that "daughters of society" may indeed grow up, but they are never too old to enjoy playing dress-up and attending tea parties. The deeper mission is to alter the way women over 50 are viewed by society and by each other. If you're a woman over 50, you can become part of this vital organization. If you are 50 or older, your function attire is a red hat and a purple outfit. If you are under 50, you're allowed into the organization as a "Pink Hatter," so designated by your pink hat and lavender outfit. The society decrees that no one can wear red and purple until her 50th birthday. These "rules" were created to encourage women not to dread turning 50, but to instead trumpet its arrival. The "Pink Hatter" inclusion encourages members of any generation to partake in the fun. Mothers, daughters, aunts, and even grandmothers within the same family are a part of the organization. There is a $49 annual membership fee for those who join as queens. The annual fee for supporting member status is $30. These fees are accurate as of January 2019. Membership details and a membership form can be found on the How to Join page on www.redhatsociety.com. Individual chapter queens may also set a nominal fee to belong to a chapter to aid administration and activity coordination, but that option varies by chapter. Usually 20 or fewer women make up a chapter, and the group typically meets monthly. Chapter members decide what they want to do as a group. It may be something as simple as getting together for coffee every Wednesday, helping fill boxes at a food bank, or going out to the opera in full regalia. This author once experienced the wonder of more than 150 members filling a movie theater for a showing of Calendar Girls. The most important thing about choosing activities is that each member contribute to the fun and social networking of the group. Members are encouraged to give themselves titles, and the general rule is the goofier, the better. Individual chapter leaders can be "Queen" or "Queen Mother." Other members' titles run the gamut. "Vice-Mother, The Mother of All Vices" for the chapter leader's assistant; "Mistress of Anxiety, The Patron Chapter Worrier"; "Lady Bakes-A-Lot"; and "Dame I Don't Give A Damn" are just a few of the monikers that stress the tongue-in-cheek point of the exercise. Learn more about the red hat club with the following fun facts. The Red Hat Society is not a nonprofit organization, nor is the society as a whole affiliated with any charities. It is classified as a social club, and thus frowns upon members or queens using it to promote products or services. "Hatquarters," the official organizational arm, coordinates a variety of fun events and trips for members to enjoy. Red Hatters can also get the "Purple Perk" card for deals on shopping, travel, and other merchandise by select retailers. There is also a limited engagement musical, "Hats!" that debuted in 2007 in select North American cities. No matter what the activity, Red Hatters seek to find the joy and wonder in the world, all while looking fabulously glamorous, of course.